Cormac Begley is a bass, baritone, treble and piccolo concertina player from a West-Kerry musical family. 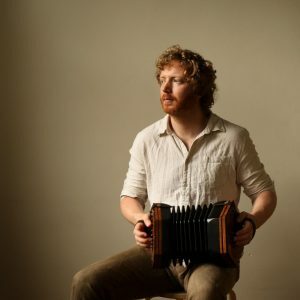 He plays in a number of projects including: duets including Liam O Connor, Caoimhín O Raghallaigh (hardanger d’amore) and Liam Ó Maonlaí (singer and multi-instrumentalist), Rushad Eggleston (cello); a trio entitled ‘Concertina’ (Noel Hill and Jack Talty); and with the band Ré. He is the founder of Airt and the award winning Tunes in the Church live concert series in Galway and Dublin. In 2014, he received the Seán Ó Riada Award for concertina playing and his playing has been described as ‘a masterclass in timeless musicianship’ by the Irish Times (*****). He has recently recorded his debut solo album featuring the full range of concertinas to critical acclaim and has received nine 5-star review to date (e.g., The Irish Times, Folking.com, The Herald Scotland, Folk Wales Online Magazine). In 2018 he was nominated for ‘Instrumentalist of the Year’ for RTE1 Folk Awards and his solo album was shortlisted for the Irish Times album of the year (Top 5 in 2018). “Album of the Month” on Midnight Campfire, Juice FM & Totally Radio.